A great fast growing and fast flowering creeper from Southern Africa, with lots of yellow to orange flowers with black centres. This plant is generally grown as an annual in the UK, sown in autumn or spring with flowers from June all the way through to September. It will climb or trail to a height of about 2.5m. It can also be grown as a conservatory plant and will flower in winter/spring if sown in summer. Black Eyed Susan will grow best in sun to light shade and moist well drained soil. It flowers best with regular feeding during flowering. The plants need support to climb, looking good on trellises, arches and obelisks. Pack of 40 seeds. 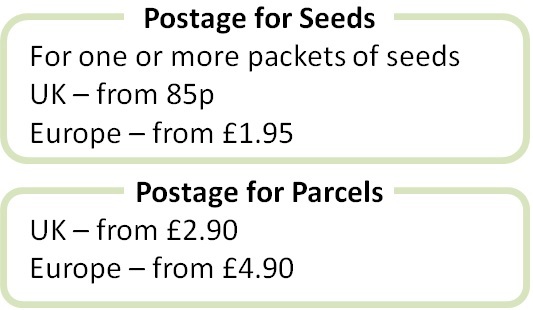 Sow in autumn or spring for summer outdoor flowering, or summer for winter indoor flowering. Sowing instructions and a colour photo are printed on the packet. Sow Sow autumn or spring for summer outdoor flowering and summer for winter/spring in-door flowering. Sow the seeds 6mm deep in moist seed compost. Keep at 20 – 25°C and germination takes 2-3 weeks. Transfer seedlings to pots when big enough to handle. Harden off seedlings before planting out. Grow Water and fertilize regularly. This plant needs support to climb – such as a trellis, arch or obelisk. Plants die back to the ground after flowering and being frosted and can be removed. In warmer gardens/winters, they will survive the winter and start growing again in spring. Conservatory plants survive for many years. Trim back as necessary after flowering.